Strong winds will develop over Colorado tonight and early Wednesday. A High Wind Warning is in effect for the northeast plains for gusts of 40-60 mph starting early Wednesday. Temperatures will be a little cooler on Wednesday with highs in the upper 40s to around 50 degrees in Denver and in the upper 20s to low 30s in the mountains. The mountains will pick up 4 to 8 inches of snow tonight through Wednesday afternoon. A Winter Weather Advisory is in effect for the central and northern mountains. Highs will be in the low to mid 50s again Thursday for lower elevations, with 30s in the mountains. Skies will return to mostly sunny across the state. Friday will be warm and dry with upper 50s to low 60s under a mostly sunny sky. In the mountains, get ready for spring skiing conditions with temperatures in the upper 30s to low 40s. The weather pattern will shift a bit over the weekend, with colder temperatures and a better chance for fresh powder in the mountains. 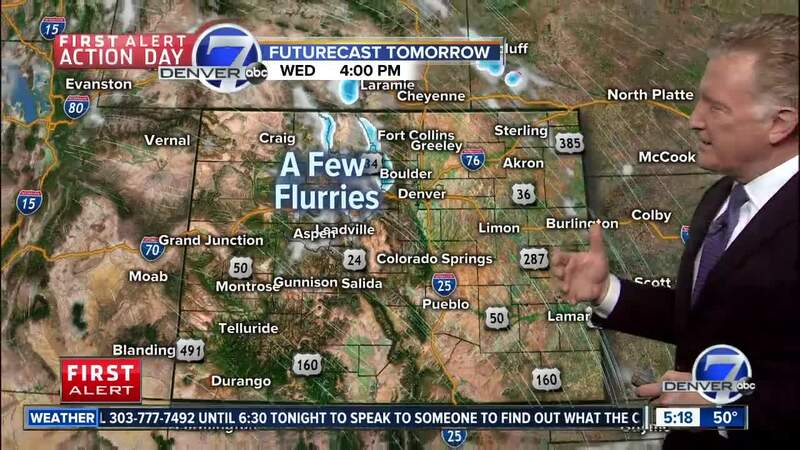 Denver will be have highs back in the 40s with some flurries possible on Saturday. Some flurries may fall on Saturday in Denver, but Sunday, Monday and Christmas Day are looking to be cool and dry. It does appear that the weather will slip back into a more active pattern Christmas night and on the 26th with colder temperatures and a chance for snow in Denver! A reminder, our annual HOLIDAY HOTLINE will be available again Wednesday from 4 PM until 6:30 PM. Free, travel weather forecasts for wherever you may be heading this holiday season. Watch Denver7 for details!